The tile industry event of the year takes place every September, and once again the Tech Tile team was not going to miss out… .We eagerly boarded the plane to Bologna, Italy for the annual Cersaie trade show to discover the latest in tile trends, and bring some of the best ones back to add to our collection. We were not disappointed. 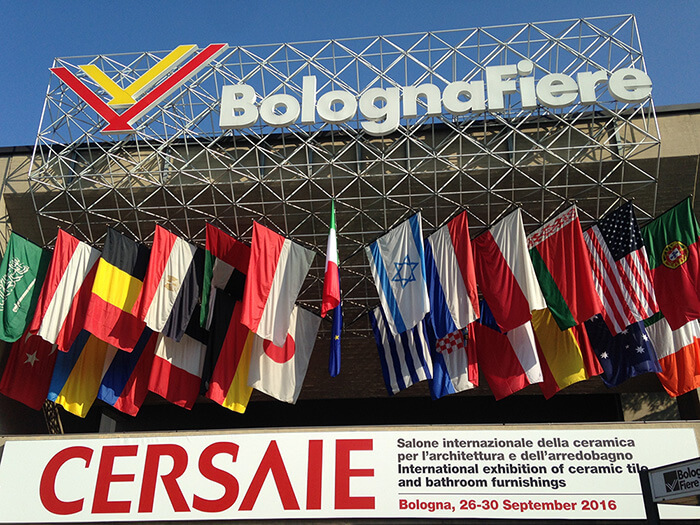 Cersaie attracts more than 850 tile manufacturers from around the world and this year’s show was brimming with technically brilliant tiles that used size, shape, colour and texture to push the design boundaries. 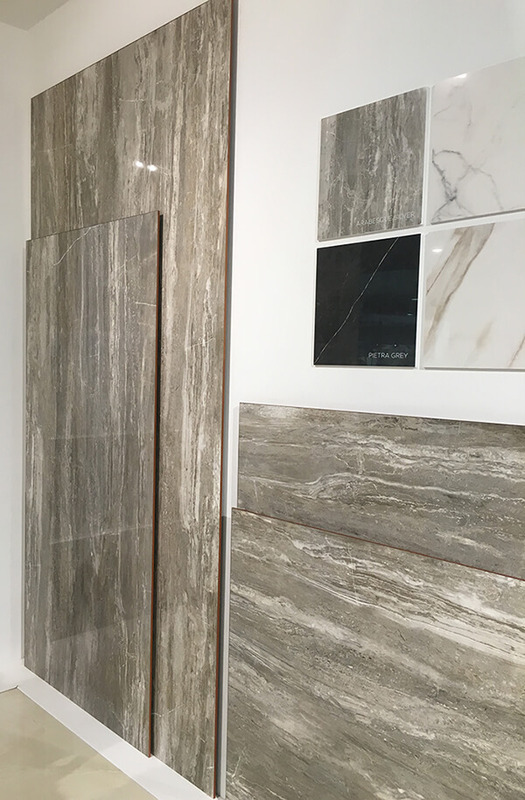 We found the growing trend for supersized tiles has taken a leap forward this year with some stunning products on display. 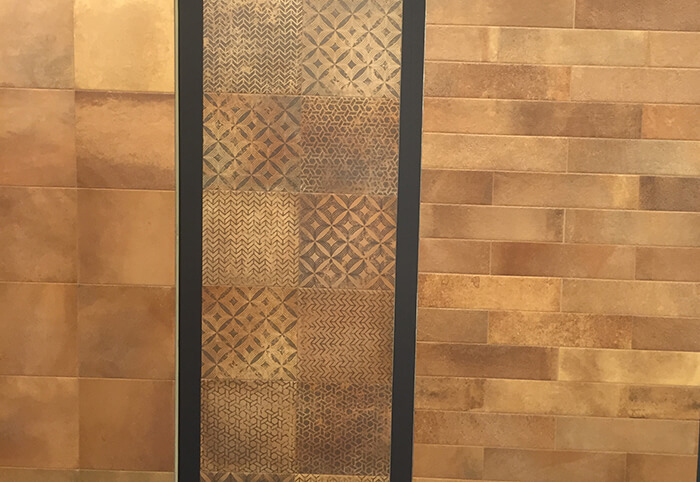 Some manufacturers were using the impressive ‘bookmatching’ effect to create mirrored tile patterns copied from natural stone, across huge surface areas. The sophisticated techniques used to create this effect put these tiles in the top price range. In contrast to these extra large format tiles, we found there was also a revival of the much smaller formats, which can bring out finer detail and texture. 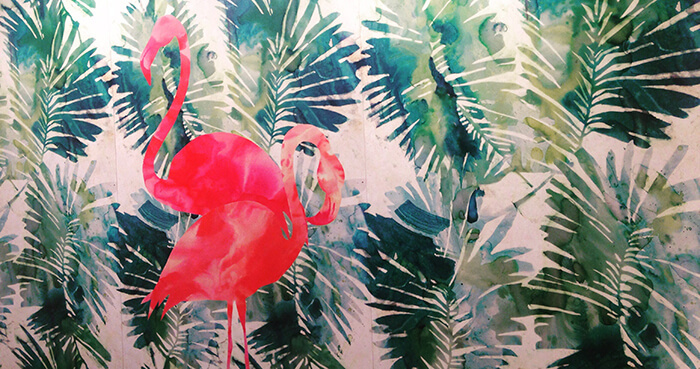 We think using both of these formats together can give your spaces a real wow factor. Geometric patterning is still prominent, and this year the focus was on using these striking patterns together with strong colours to generate unlimited configurations, giving everyone the ability to be able to personalise their own space. 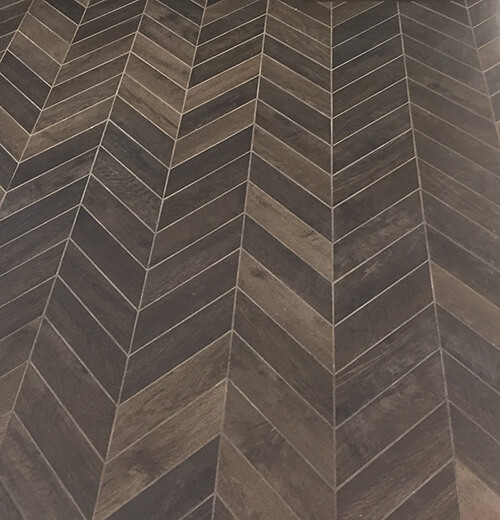 Parquet flooring was also a key product type throughout the show, revealing the growing trend for ‘heritage’ surfaces, which we think will be one to watch in 2017. Rose pinks, light greys and diesel blues were all in evidence this year, as well as the warm tone of terracotta, which is making a comeback as a key trend for 2017. We also loved the fashionable botanic theme, with fresh greens, blues and bright primary colours creating a sense of the exotic. 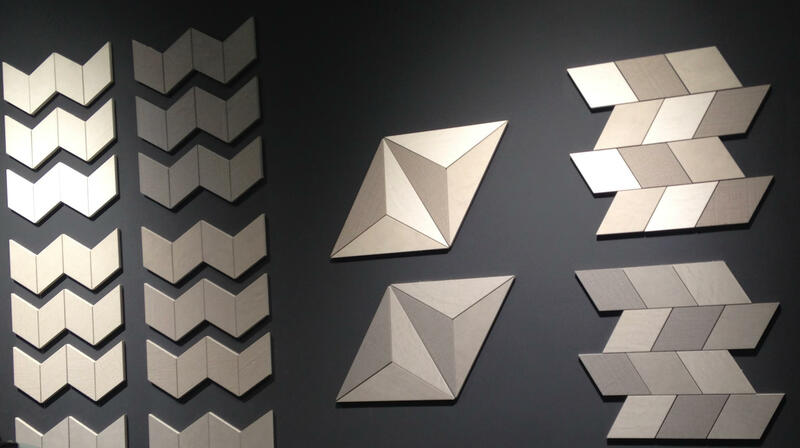 Printing technology has advanced to the point where it is more difficult to tell imitation tiles apart, resulting in some exciting new innovations. 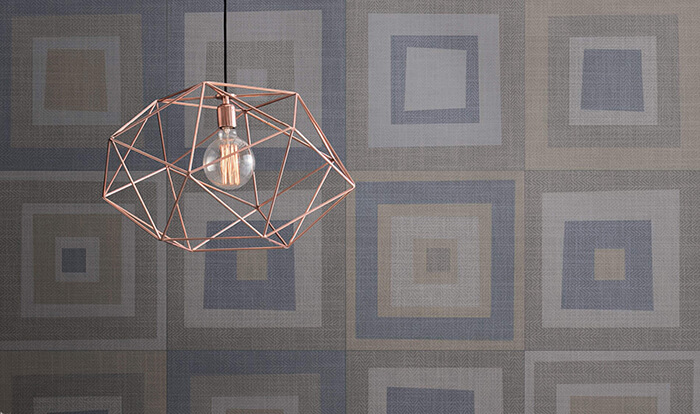 We particularly love the new textile-effect tiles, prominent here in greys, blues and neutrals. These tiles are not only visually stunning, but add an extra dimension through their ‘woven’ texture. It is very evident that textured surfaces are fast becoming a standard tile design to add depth and interest to surfaces. 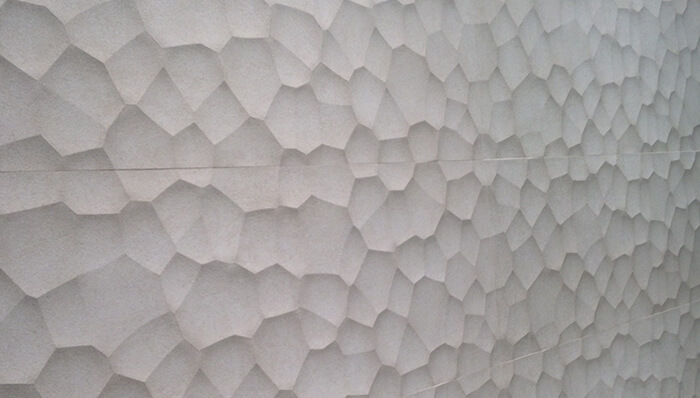 We saw that some manufacturers are taking this theme further by using 3D relief to give surfaces a truly modern twist. We brought some of these key trends home with us so keep an eye out on our What's New section as we launch them throughout the year.